Detailed designs are currently under way for the project. Six Construct’s concept of A sustainable neighbourhood in Masdar City includes thermal efficiency, recycling and the use of low-embodied carbon materials. 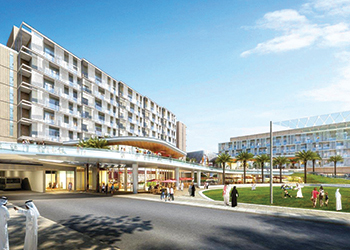 Six Construct of Belgium has been awarded a contract to design and build a new project in Masdar City, the flagship sustainable development in Abu Dhabi, UAE. The Masdar Institute Neighbourhood, which spans 56,200 sq m, is currently in the detail design phase, and will be completed in a period of 30 months. 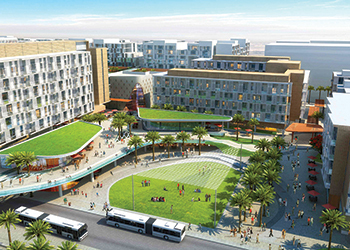 The project comprises nine buildings, and will provide residential accommodation for Masdar Institute students, as well as corporate residences and an office building. Retail areas within the buildings and public spaces, are also part of the scope of works. Masdar Institute Neighbourhood ... sustainable, compact and walkable. Key features of the design to help achieve these targets include climatic design to encourage wind movement and provide shaded external spaces to improve outdoor thermal comfort, high-performance building facades, efficient HVAC (heating, ventilation and air-conditioning) systems and user controls, as well as the application of building integrated renewable energy. Installation of efficient water fixtures, as well as greywater recycling for irrigation use, including waste-segregation facilities to enable recycling, and low-embodied carbon material selection will form an integral part of the project. The central vision for is to create a sustainable, compact and walkable neighbourhood. To achieve such a neighbourhood, the plan has been conceived as a series of connected visual and perceptual experiences as one moves through the site. “We believe that Masdar Institute Neighbourhood will definitely be a desirable residential standard for a sustainable and carefully designed community, and this project will certainly provide invaluable guidance to future development projects in the region,” says Nalouti.